Jules Verne's Mysterious Island opens with images of a turbulent, unsettled ocean (over opening credits and a brilliant, bombastic Bernard Herrmann score.) Immediately after this interlude, the film lands the audience in Richmond, Virginia during the Civil War, at the siege of 1865 to be precise. In short order, the audience witnesses brutal warfare -- brother-against-brother -- in close-up with sputtering, smoking cannons, and then, once more, Nature us unsettled in the form of driving, never-ending rain...during the "greatest storm in American history," according to a voice over. Before long, a group of Union Army prisoners of war, led by the dashing captain, Cyrus Harding (Michael Craig) escape from this violent "modern" setting in an observation balloon. His group includes cynical war reporter Gideon Spillt (Gary Merrill) as in"spilt" or "spilled" blood; a Confederate soldier held captive, Pencroft (Percy Herbert), and an emancipated African-American Union Soldier, Neb (Dan Jackson). One of the young soldiers, Herbert (Michael Callan) harbors fears that he is a coward. These diverse men soon become "prisoners of the wind" when they find themselves unable to control the wandering balloon. They end up high over the ocean first, and then -- in a harrowing and terrific special effects sequence that hasn't aged badly at all -- face a fast-moving descent (er, drop...) that smashes them in the water just short of land. Captain Cyrus falls into the swirling sea a mile short of landfall but is rescued by a mysterious, unknown presence. 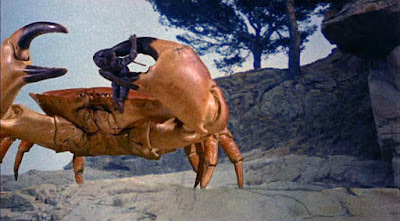 If you've seen this film before (shot in "super-dynamation" with special effects by the legendary Ray Harryhausen), you'll recall that the team makes landfall on a strange rocky island that recalls the creepiest aspects of Kong's Skull Island (down to a chasm which can only traversed by a fallen tree...). The island consists of such oddities as live volcanoes, subterranean sea grottoes, and most frighteningly, roaming gigantic wildlife. 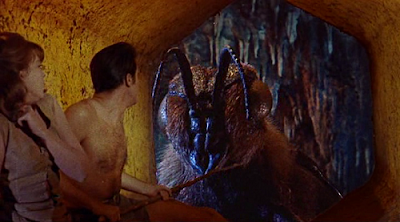 The stop-motion "monsters" featured in the film include a colossal crab, an over-sized chicken, and most disturbingly (and convincingly rendered...), a veritable swarm of giant bees. The marooned 19th century men face these over-sized beasts with equanimity and calm while they attempt to construct a boat and escape. Also, to their unceasing delight, the men discover two modern women trapped on the island, the regal Lady Mary Fairchild (Joan Greenwood), and the mini-skirt wearing hottie, Elena (Beth Rogan). These castaways together seek haven in "The Granite House," a high mountain cave that becomes their sanctuary. Far distant from civilization (New Zealand, the closest outpost, is some 1873 miles away...), this small but incredibly diverse "family" begins to form a Utopian society of sorts, reflecting the changing and evolving nature of the United States, Civil Rights, and world at that time the film was was forged. For instance, we see here a black man and a Southern white working together in peace, as well as working women contributing to the survival of the group. It's important to recall much of what was happening in the world at the time the film was released: young, optimistic Kennedy had just been elected President; his predecessor, Eisenhower, had signed the Civil Rights Act of 1960, and so on. The great accomplishment of this isolated group, however, are contrasted in Mysterious Island with the nature of society itself. Bloodthirsty pirates arrive on the island to commit murder, and America is locked in a deadly Civil War. Again, in 1960, the first 3,500 American soldiers were already serving in Vietnam, Eisenhower's final address in '61 warned of the looming dangers of the "Military Industrial Complex," and the U-2 Spy Incident of 1960 heated up the Cold War. In 1961, as in the 1860s of the film, every step towards peace that man made seemed threatened by a backward step into warfare, destruction, and self-annihilation. I bring up these specific historical currents and events not because Mysterious Island alludes to them in any direct fashion, but because of the manner in which the film presents the islanders' secret benefactor, our friend Captain Nemo (Herbert Lom). Near the final act of the film, we learn that Nemo has been protecting Harding and his entourage from death, and furthermore, that he has been toiling away on the island, "conducting horticultural experiments" on animals. In other words, the gigantic animals are his creations, because Nemo has opted to "destroy the concept of warfare itself." By creating giant animals, he is creating for man an inexhaustible food supply. He is attacking the root causes of war and injustice. Hunger, prime among them. Unfortunately, Nemo doesn't survive the climactic escape from the island, leaving the diverse Utopian group to carry his message of peace back to civilization, to "end strife among men." 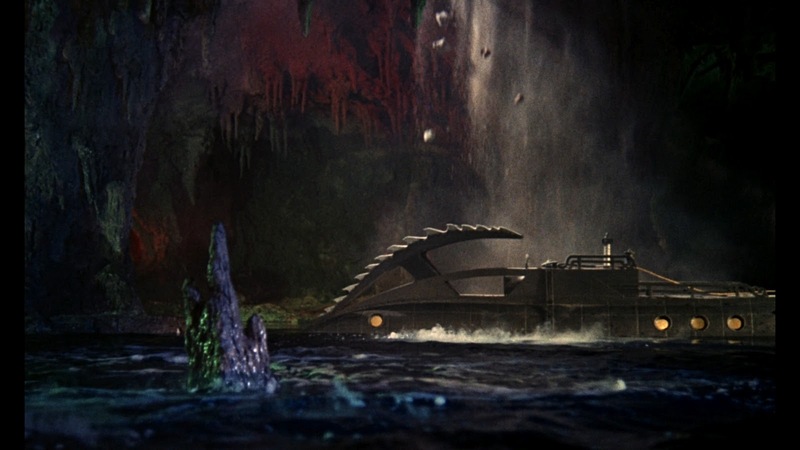 Nemo's message of peace and brotherhood in Mysterious Island is a clear a sign of the dawning of the 1960s Age of Camelot, just as 1954's 20,000 Leagues Under The Sea reflected the atomic age anxieties of the early Cold War. Yet as admirable and valuable as this message remains, it would be foolish to state that this variation on Nemo's story is a literal or faithful interpretation of Jules Verne's novel, Mysterious Island. For instance, in the book Nemo reveals his true origins (as Prince Dakkar, an Indian national...) to the castaways. Nothing of that sort happens in the film version. The Nemo of the book and the film do share much in common, however. They both remain hungry for liberty and independence, but the Nemo of the Endfield film wishes more: to "save" civilization; a sweeping desire the literary Nemo did not share. He destroyed warships, yes, but that literary Nemo had little affinity for his fellow contemporary man. These changes from book to screen won't affect your enjoyment of the film, but they are certainly worth noting. More importantly, perhaps, Lom does a fine job bringing an older, white-haired Nemo to life, even if we don't learn the details of his heritage. Lom exudes dignity and charm in his portrayal, and seems a hair more approachable than James Mason's Nemo. He's a little softer and less brittle. 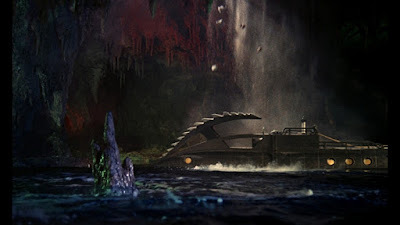 Another point worth mentioning: Mysterious Island has designed Nemo's magnificent submarine, The Nautilus (interior and exterior) to very closely resemble the craft as seen in the famous Disney picture. The attempt here is clearly to make this not only an adaptation of Verne's work, but rather an unofficial sequel to a popular movie. But just take a gander at the great hall of the Nautilus (with velvet sofas and massive pipe organ...), because it's a dead-ringer for the set design in Fleischer's film. The miniature of the Nautilus exterior here also features the trademark front "spine" made famous by the James Mason/Kirk Douglas classic. This is good cross-movie-continuity if you are inclined to gaze at it as such. These days, especially with movies, it's always popular to deride older productions as being campy or corny, or my least favorite descriptor in existence: "cheesy." Mysterious Island suffers from virtually none of these faults and I was amazed to see how well the film's set pieces and action sequences hold up to present-day scrutiny. The Harryhausen-created scene in which Herbert and Elena become trapped in a honeycomb (with a giant bee...) is beautifully realized, as is the first discovery of the Nautilus in the cove. Although it makes heavy use of rear projection, the opening scene in Richmond -- with the daring balloon escape -- is tightly-edited and impressive. The film version of 20,000 Leagues Under The Sea took pains to establish that the anti-hero Captain Nemo was an anguished, multi-faceted man, both a "devil" and a "a genius." Mysterious Island reflects that debate in just one brief dialogue sequence, but it's clear where the movie's loyalties rest: Nemo is meant to be seen here as a hero, as a savior, as man of peace attempting to help all mankind. That takes some of the fun (and humanity...) out of Nemo, but Mysterious Island remains a richly-imagined, fun, action-packed fantasy. 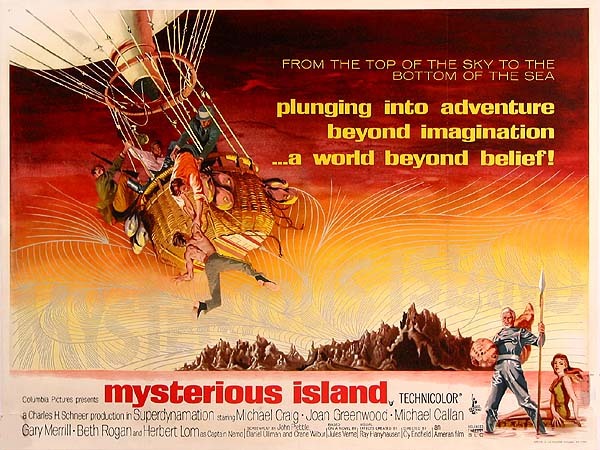 Mysterious Island is the kind of film that made Saturday afternoons special way back in the 1970s. Refreshingly, it hasn't lost an iota of its visual or fantasy luster, even if Nemo himself has perhaps been sanitized a bit too much. John good review of this wonderful unofficial sequel to the 1954 film. Herbert Lom best known for his Peter Sellers Pink Panther films is interesting as Captain Nemo. I was so pleased in the '70s when I saw this film, like you, because the production design of the Nautilus was so close to the '54 Disney film. Mysterious Island was a staple of my childhood years. The film was played regularly on Chicago's WGN, usually Sunday afternoons as part of the Family Classics movie lineup. It didn't escape my attention that the film was practically a sequel of sorts to Disney's 20,000 Leagues Under the Sea, although the Nemo seen here was much more affable than the James Mason version. Over the years, the films have merged in my mind. 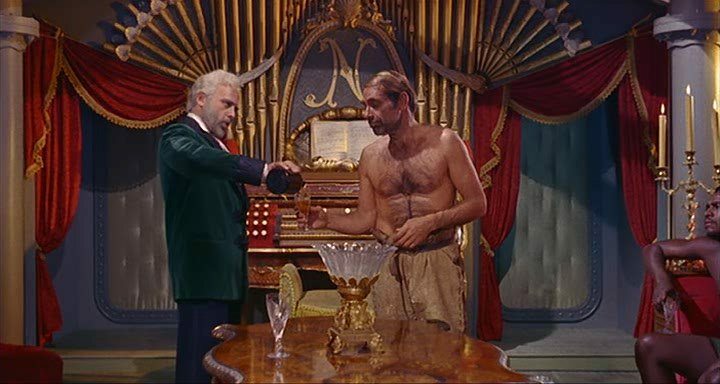 I recently acquired 20,000 Leagues on dvd and anxiously awaited the scene in which Nemo takes his guests on an underwater walk and shows them the remains of Atlantis. I waited...and waited...and the scene never appeared. Afterwards I realized that the scene in question was in Mysterious Island! The film makers did a really great job paying homage to the earlier work, and that attention to detail could not have been accidental.